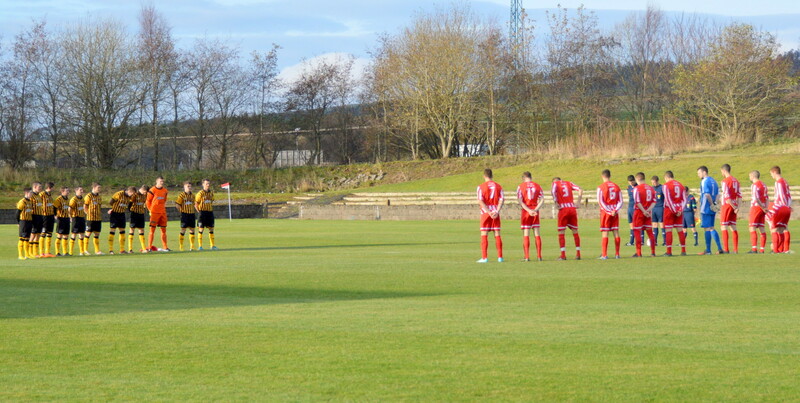 A minute’s silence was observed prior to kick off as a mark of respect for young Nathan McSeveney from Cumnock who lost his life after a tragic accident at the end of the Scotland and Ireland game at Celtic Park on Friday night. Nathan was a close friend of Glens’ midfielder Darren McGill and the thoughts of everyone at Glenafton Athletic are with Nathan’s family and friends at this sad time. 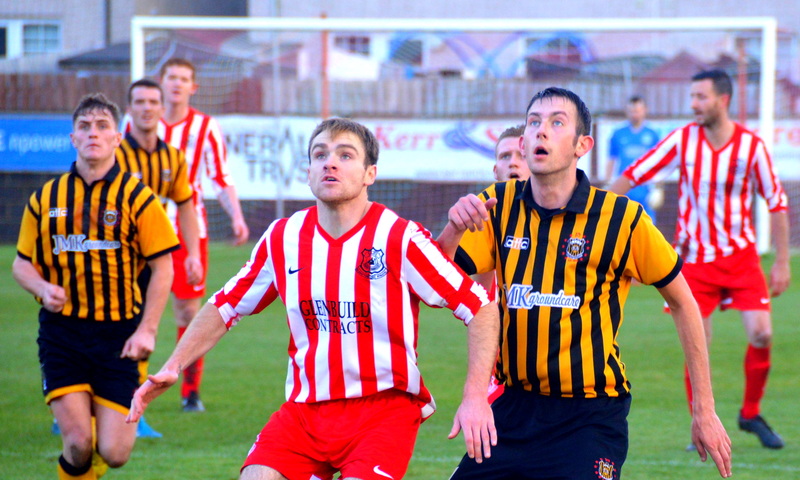 There was to be no repeat of the recent Ardagh Cup final between the two sides when Glenafton outplayed their opponents for long spells of the game with fine fast flowing football. Talbot were determined not to give the Glens the same freedom of the park and the first half proved to be scrappy affair with play interspersed by free kicks and devoid of any real clear cut chances. 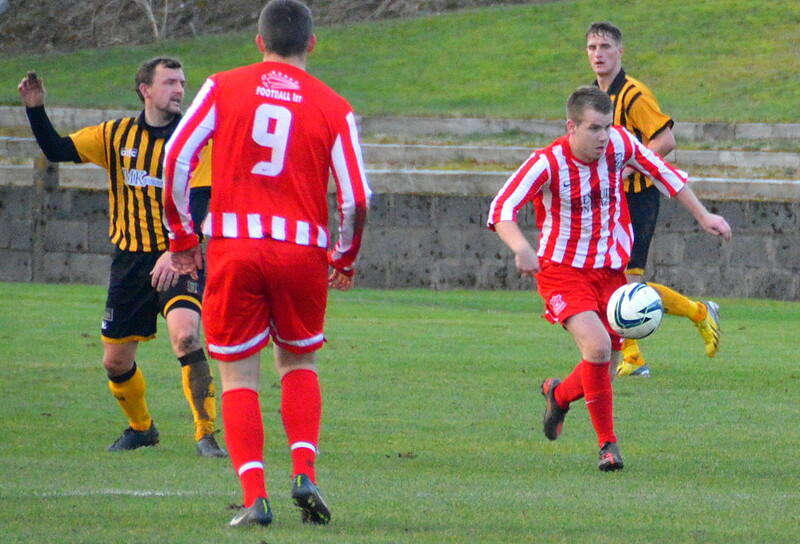 The visitors earned an early corner kick which was headed over the bar by Graham Wilson. On 8 minutes the same player from the corner of the penalty box tried to curl a shot into the top corner only for former Talbot keeper Brian McGarrity to rise and clutch the ball comfortably. At the other end, a minute later, Adam Strachan from tight on the left flank cut the ball inside to Aaron Connolly who rolled it on its way to Jamie McKernon for the midfielder to thunder a shot from 30 yards out which was well held by keeper Andy Leishman. It was the same outcome soon after when Connolly cut in from the right before trying his luck from 25 yards. On 14 minutes McKernon switched play with a cross field pass to Strachan who killed the ball with style on the left hand touchline and although he skipped past Willie Lyle into the box with ease, centre-back Mark Campbell was on hand to bring the Glens attack to an end on the bye-line. Six minutes later Craig McCracken was fortunate to stay on the park after a wild lunge on Cameron Marlow, certainly the offences that earned a flurry of yellow cards later in the game appeared tame in comparison. Keir Milliken’s run down the left was mopped up by the Glens’ defence and McGarrity’s clearance was picked up by Alain Kinney who made good progress down the left before clipping the ball across the face of goal for Connolly but again the impressive Campbell came to the rescue with a clearing header. Back came Glens and Strachan rolled the ball from the dead-ball line for Alan Cairns to cross into a crowded box where Marlow trapped the ball, turned and fired only for his shot to be blocked by Lyle and eventually cleared by McCracken. The home side continued to press and another Cairns cross into the box was confidently clutched from the head of Kinney by Leishman. Daniel Orsi’s persistence down the right won the Glens a corner-kick which was missed by all and sundry in the box and the chance gone. McGarrity was called into action immediately after the re-start although it seemed to be a case of being in the right place at the right time as Dwayne Hyslop’s close range effort cannoned off the Glens keeper’s chest and the ball scrambled cleared. Nevertheless it heralded the start of a sustained period of pressure from Auchinleck with the home side pegged back deep in their own half. Two minutes later from a Talbot free-kick, the keeper bravely punched the ball from the head of Campbell who was proving to be a thorn in the Glens side, both in defence and attack. Yet another free-kick saw Ryan McChesney beat Campbell in the air to partially clear the ball and then McGeoghegan come out on top against McGoldrick. Talbot recovered the ball and Milliken on the right whipped it to the back post where Campbell got the better of McChesney in the air but not off McGoldrick who crouched to cleanly clasp the ball. 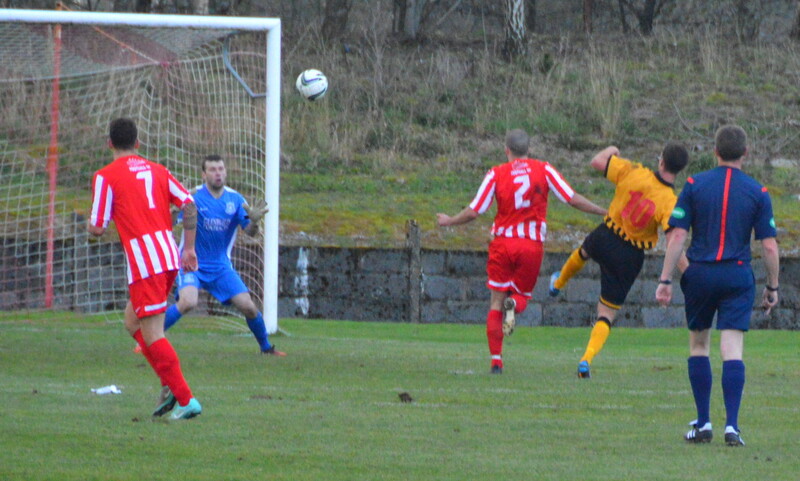 Some respite for the hosts as Craig Menzies and Orsi combined down the right before Gordon Pope made a timely clearance. Orsi gathered the resultant throw-in at the near post but McGoldrick blocked and cleared his attempt to feed Connolly. 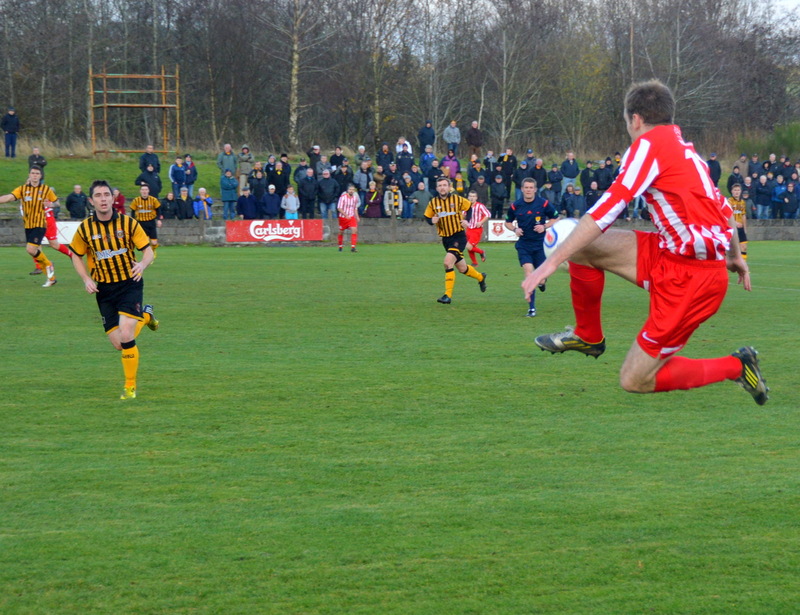 Back came Talbot and Menzies’ outstretched leg prevented Wilson’s pass from setting up Millken with a free run to goal. On 59 minutes the visitors’ pressure produced the goal that was on the cards. Leishman launched the ball upfield where it was met by the head of Wilson before arriving at Keir Milliken, who while leaning back on his right foot calmly and precisely lobbed the ball over the head of the advancing McGarrity and into the net with his left. 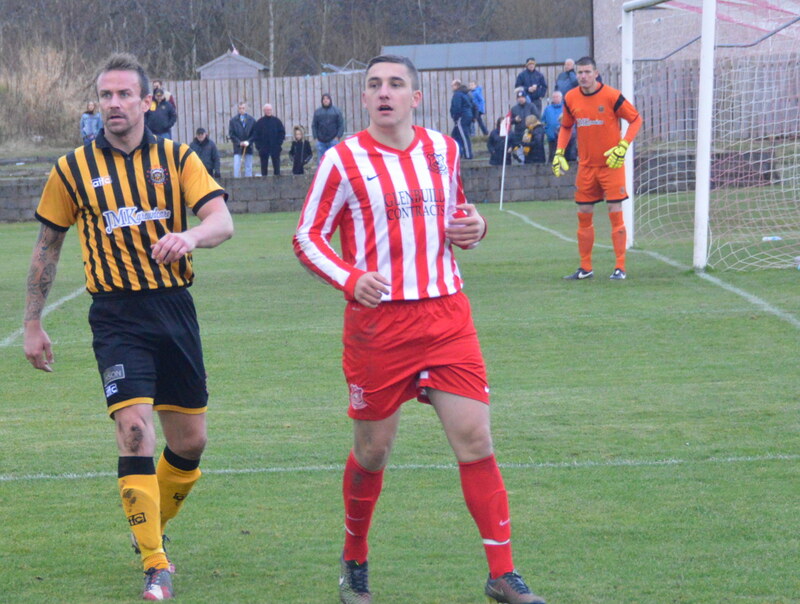 Glenafton responded with their first meaningful attack of the half. Strachan streaked down the left before knocking the ball to Kinney deep in the box, the striker taking a touch or two before driving a low angled shot from the corner of the six yard box that was diverted past the post by the feet of Leishman. The big keeper then gathered the resultant corner without a challenge. On 68 minutes Talbot’s penalty claim for handball were waved away and a minute later McGarrity pulled of a stunning save from Campbell’s close range header. From the resultant corner the keeper was clearly impeded by Wilson at the back post and the whistle blown before the striker’s header hit the inside of the other post. Glens responded through Orsi down the right who laid the ball off to Connolly and in a flash he fired it across field to Strachan hugging the left touch line his cross back into the box was met by Kinney as and although the header was on target it lacked the power to trouble Leishman. Another determined run down the right by Orsi ended with his cross into the box being intercepted by the head of Lyle which had Leishman stretching high to prevent the ball dipping into the top corner of the net. With 15 minutes to go both sides made changes with Glens bringing on Patrick Walker for Alan Cairns and Talbot replacing Dwayne Hyslop with former Glenafton striker David Gormley. 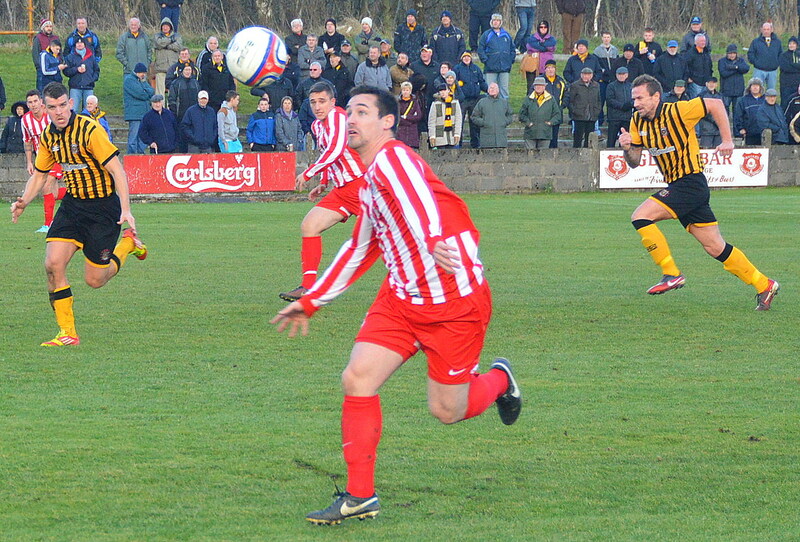 Five minutes later the home side brought on former Talbot striker Michael Reilly for Daniel Orsi and the visitors replaced James Latta with Colin Spence. McKernon’s shot from the corner of the 18 yard box whizzed wide of Leishman’s post and Walker’s drive from the edge of the box was gathered by Leishman. 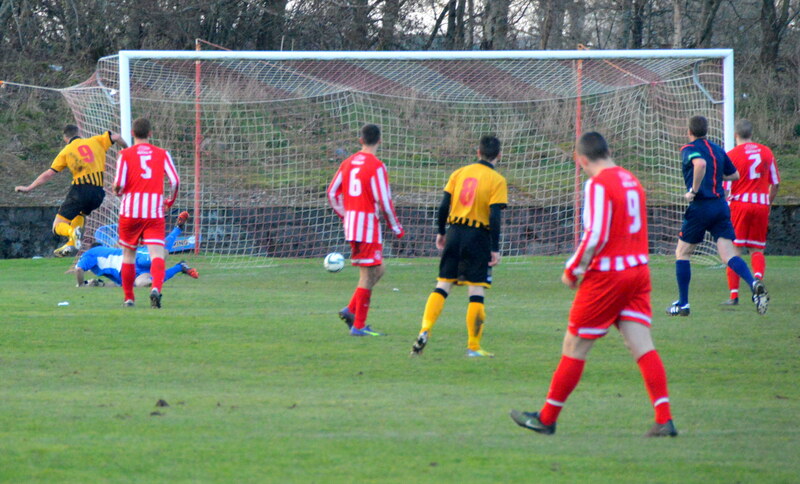 In between times, at the other end, Wilson’s header from Gormley’s cut back sailed over the bar. The home side’s hopes of salvaging a point dissipated with 5 minutes to go after a clever touch by Gormley outfoxed the Glens defence and his disguised pass released Graham Wilson with the freedom to pick his spot and drill the ball beyond McGarrity. The goalscorer replaced with Mark Shankland straight after.